Where do I start to describe our first visit to China? Seldom we have experienced a 14 days trip with so many impressions. 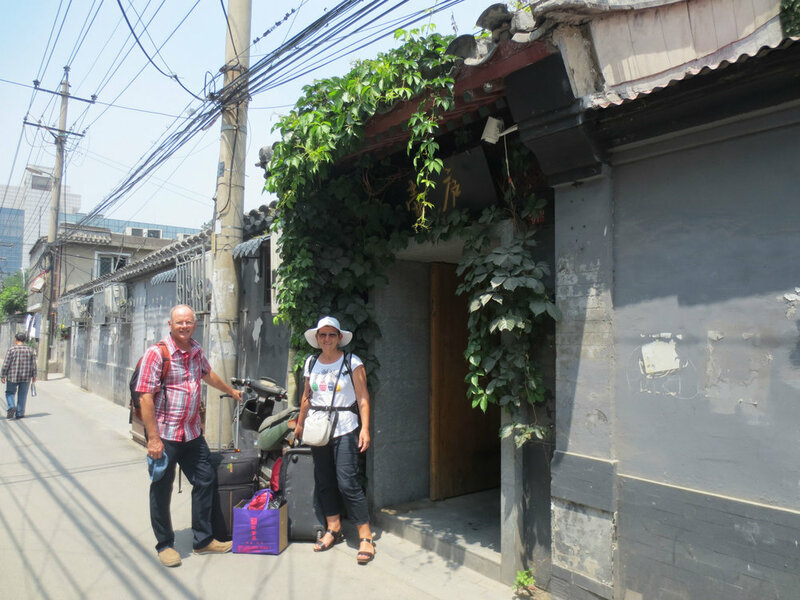 We spent three days in Shanghai, took the train to Beijing which we explored five days. The last leg of our journey again a train ride to the city of Xi'an. 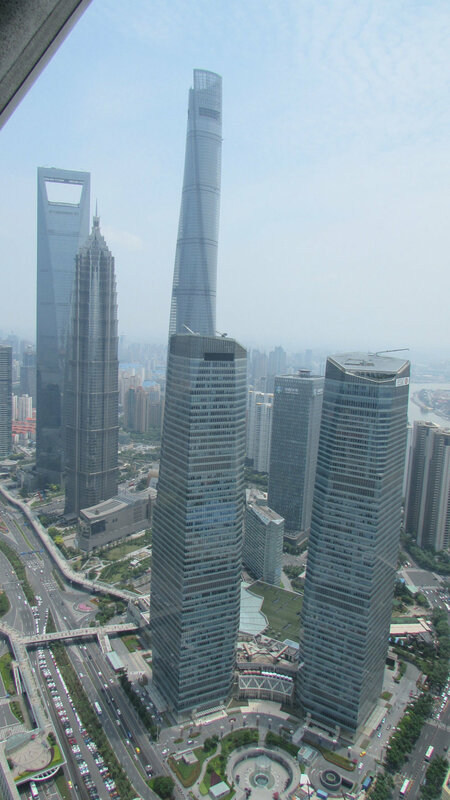 In a nutshell, China is bigger than anything we have seen before, full of contrasts and oddities. were smooth and clean. When we crossed the roads we had to get used to the e-bikes which we did not hear coming in the busy traffic. No littering, no graffiti. Doormen, (street-) cleaners, (parking-) attendants, public transport personnel all wore neat and colourful uniforms. In shopping malls, airports, railway stations and restaurants there was readily WIFI provided and the locals paid wireless with smartphones rather than their credit cards. To experience the fastest operating train in the world, Francien and I took the seven minutes ride from Pudong to the international airport in the magnetic levitation train (Maglev train). We boarded the train and within a minute reached a stunning speed of 431 Km/hr. We could hardly feel the acceleration, but when the train took a slight curve we could feel the huge centrifugal forces! This is a metaphor for Shanghai. What a contrast with that old man on his bike carrying bamboo's we saw crossing a side road off the Bund just a few hours later! Everywhere in the cities we visited in China there were huge crowds. But it never felt as crowed as e.g. Hong Kong or any big city in USA or Europe, because crowd controlling was very well done: We saw a conductor in the back of a bus waving a small red flag warning pedestrians to move away so that they will not be hit by the bus when it turned a corner; a yellow coloured uniformed attendant ushered passengers into the busses; attendants with megaphones telling (or should I say yelling?) people to keep walking. Although all passengers going into the underground had to go through a security check (luggage was scanned at all entrances), the never ending flow of people kept moving into spacious stations. 30 Meters wide underpasses and up to 1.2 km long circular pedestrian sky-walkways above the intersections helped people to cross wide and busy roads. 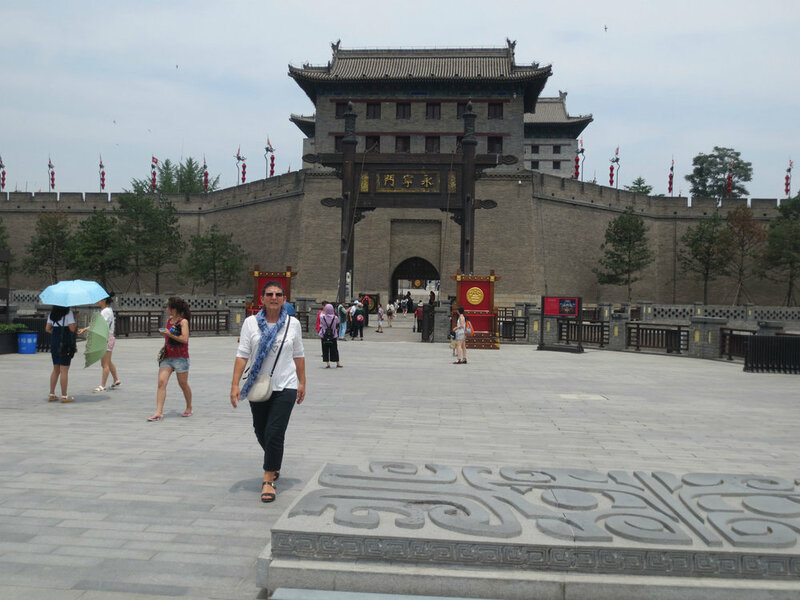 We walked many miles in this modern city and were excited to travel to Beijing. Our long distance high-speed train left from the newly built Hongqiao railway station. We had to wait in the departure hall (looked like a modern airport departure hall) above 29 dedicated platforms until 15 minutes before departure. Only then we swiped our tickets on the automatic turnstile gates and took the escalator down to the platforms. We sat comfortable in the spotlessly clean train, whisking us with a speed of 300 km/hr to Beijing. The train stopped only once and we travelled a distance of 1200 kilometres in just under five hours. The next morning our guide Yaxin picked us up with his car and together drove two hours to the Jiankou section of Great Wall of China. Two days we hiked on the Wall which climbs up and down the mountains (peaks up to 1000 meters) as far as the eye can see. The renovated parts are laced with parapets and watch towers every 400 meters. On the non-renovated parts there were trees and bushes growing on the remains of this ancient construction, parts had collapsed. We climbed into dilapidated brick watch towers and hiked steep slopes up and down following the mountain ridges along deep edges. The hike was anything but easy, but worth every step while we smelled the pinewoods and enjoyed the refreshing wind under the scorching sun. From the top of one of the ancient watchtowers we watched a newly build expressway down in the valley, contrasting the rapid developments in this country with such a long history. 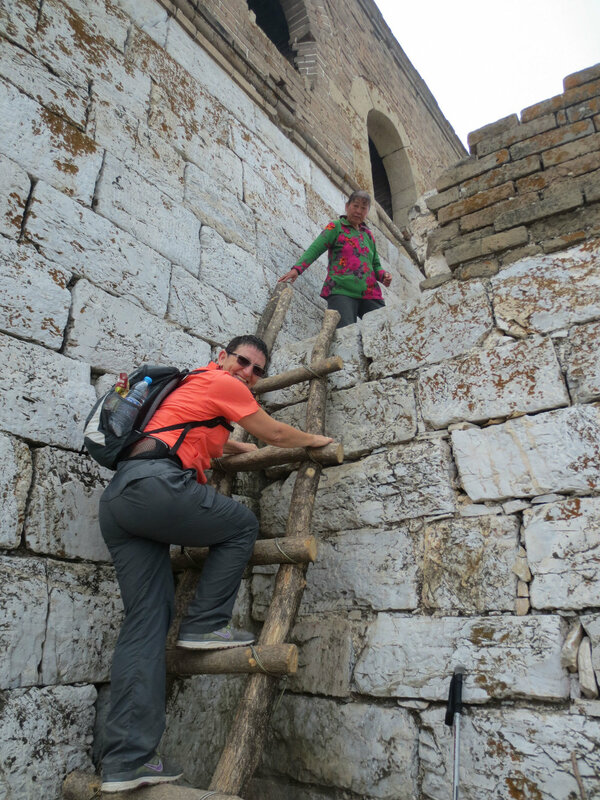 There were few people on this part of the Great Wall. Overnight we stayed in the village Gubeikou (古北口)in a homestay. Dinner in the family run home: dumplings, vegetables, rice noodles, Yangsing Beer. The next morning at 04:00 we climbed up to see the sunrise on top of the Wall. We were literally alone, on our own the Wall belonged to us as far as the eye could see! You have to walk it to feel it. 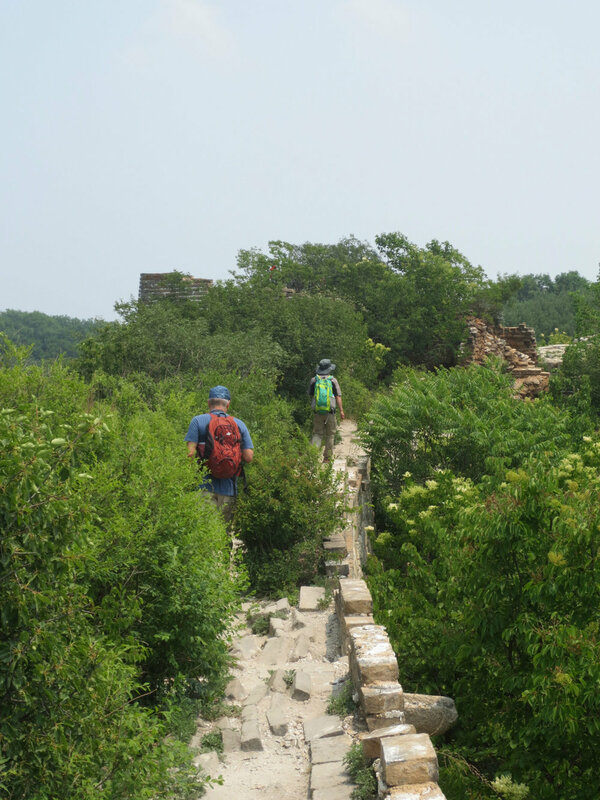 At the end of the hike Yaxin said: ‘there is an old Chinese saying: one who fails to reach the Great Wall would not be regarded as a hero.’ Hooray, we believe him! Back in Beijing Francien and I stayed in a courtyard house in a Hutong district three kilometres from the Forbidden City. In this old part of the city it was quiet and the locals lived their life away from the hustle and bustle of a modern metropole. Laundry hung over the five meter alleys and when we strolled through the alleys we smelled the food wafting from the houses. A barber cut his customer in the middle of the Hutong, people sat on their doorsteps gazing at those two foreigners. Francien and I felt homely. The contrast could not be bigger standing on Tiananmen square. This largest city square in the world it so big that we could hardly see the people walking on the other side! The Chinese flag dominated the square and thousands of people took in the views of Mao’s mausoleum, National museum, The Great Hall of the People, the south gate of the Forbidden City. Young pioneers in white T-shirts carrying red flags took pictures in front of monument of the people heroes. Mao's picture towering high above the entrance gate of Forbidden City looked smaller as I expected (from seeing it on TV and reading about it) although it is six meters high and five meters wide!! We saw few western tourists as we are ushered through this one-kilometre-long palace with its cusped roofs and huge squares. Security was omnipresent everywhere we have been on this trip, but never so in -your- face -muscle -flexing as here. Big brother was indeed watching us and they wanted everyone to know: Cameras mounted on roofs, police cars and inside buildings; Mobile police posts; Uniformed police and paramilitary; Plain clothed agents wearing black trousers and bright white T-shirt; Goose-stepping red army guards walking in pairs. 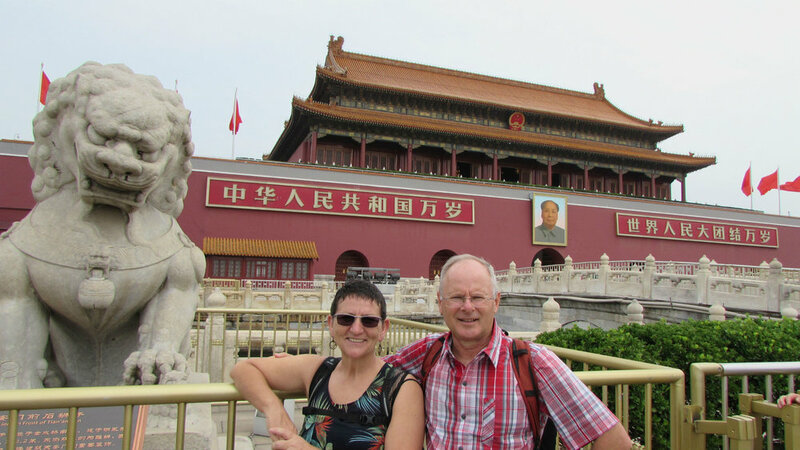 On Tiananmen square and around the Forbidden City security felt intimidating. We saw a tout violently being taken away by uniformed police (apparently she did not have a licence). When I walked passed the tomb of Mao, a grey bearded man shouted something and immediately was grabbed by three plain cloth security guys and pulled away. The next day we stood in a quiet corner inside the Forbidden City when a plain-cloth security guy walked towards us and stood next to us, listening what our guide was saying. The good thing about all this: for western tourists it is very safe to travel in China. Departing from the Beijing West Railway station, we took the mid-day bullet train (CRH) to the mega city of Xi’an. The train was full with locals traveling on this Dragon Boat Holiday weekend. We saw endless agricultural lands and city’s with hundreds of grey high rise (30-40 stories) apartment blocks and even more being constructed. After a 4.5 hour journey we arrived exactly on time. As we drove in a taxi from the airport to the city centre, Xi’an looked depressing. It felt as if all those ten million people here lived in the same standard grey residential tower blocks built by the government recently to provide affordable housing for the migrants continuously moving into the city’s. However, the ancient emperor city centre had no monotonous apartment blocks. It was surrounded by a 600 year old, 15 kilometres long city wall, encircling low rise old buildings and modern shopping streets. 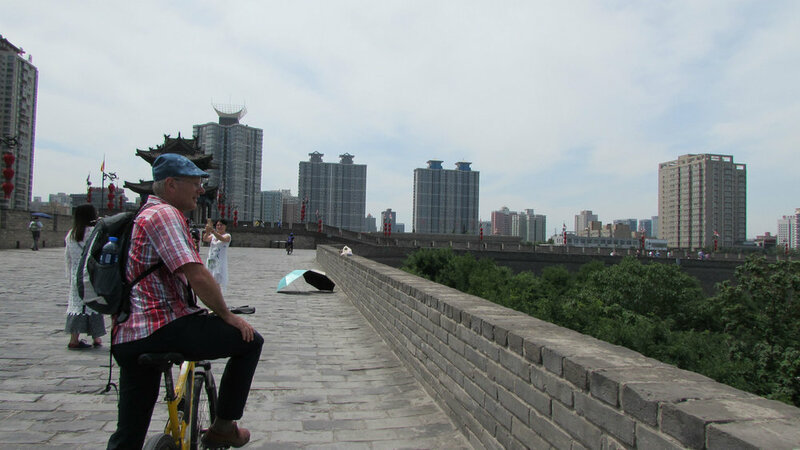 The next day we hired two mountain bikes and cycled all around this 20 meter wide and 15 meter high defence wall, giving us commanding views of the inner city. The main reason Francien and I travelled to this city however was the world famous Terracotta army. Among throngs of local tourists, we walked in three gigantic halls which protect thousands of life size 2200 year old terracotta figures. Yes, it was impressive to see these terracotta figures, each sculptured in a unique way; soldiers, archers, generals and horse drawn chariots standing. This army was to protect the emperor in his after-life! It was somewhat disappointing to us as it reminded us of the roman baths in Europe and the Greek archaeological sites we visited in Cyprus. At the exit of this world heritage site we walked through the biggest tourist-trinkets village we ever saw, prove of how commercialized this place is. Our guide asked: ’do you want to make a picture of the farmer who ‘discovered’ this mausoleum in 1974? He is still here.’ ‘No thanks, let’s get out of here ASAP’ Francien replied quiet surprised. Playing xiangqi (chinese chess) in the streets of Xi'an. Spectators will loudly give advice to the players and criticize moves. People we have seen on this trip were all well (western-style) dressed. But it looked very odd to us that with midday temperatures soaring above 32 °C, men of all ages rolled up their T-shirts to cool down when walking on the streets and in the parks. The Chinese showed hardly any expressions on their faces. 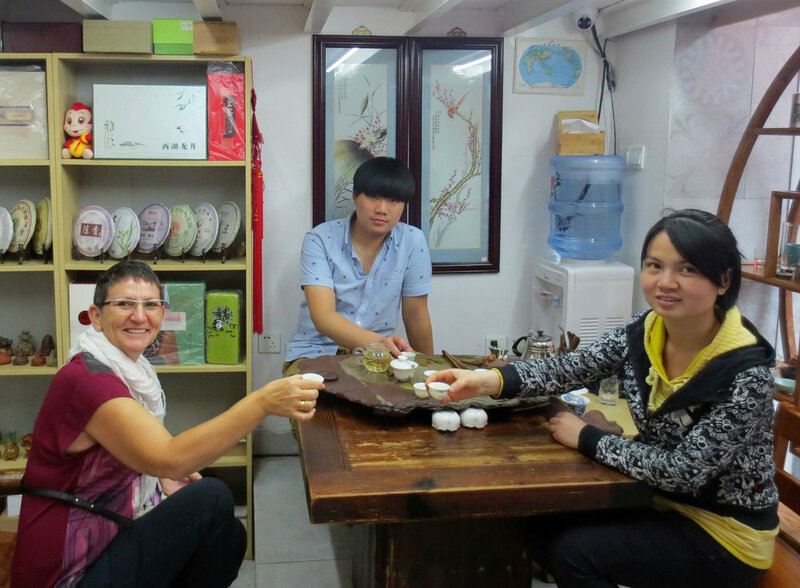 Francien loved to look in the many tea houses and to haggle with the salesmen and women. However, they are inscrutable and difficult to read. The people seemed to be industrious. We saw men and women working in roadside stalls, small shops, food stalls, cleaning the public facilities, collecting recyclable plastic and rushing in the traffic. But what stood out for us most is how loud everyone was. They constantly were yelling whether on their mobile phones in the crowded underground, in restaurants or simply on the streets. As a result everyone else was trying to talk over the others, making it even louder. It seems they find privacy in the loud crowds. Few people we met spoke English, but were trying hard to help us, even by calling others around for assistance. In Xi’an we sat down in a local restaurant, again the menu was written in Chinese and nobody around spoke any English. We were hungry and decided we had to eat something here. After pointing on dishes served to other guests, we used an I-translator on our smart phone to find the correct Chinese words to describe to the waitress what exactly we wanted. She was very keen to help us and read the words from our smartphone. We ended up having a delicious hot-pot lunch! ‘Can we practice English?’ two teenage boys asked us in a busy shopping street in Beijing. Francien and I were surprised they abruptly stopped us when we strolled along some food stalls. ‘What is your name? ‘How are you? – Where do you live?- How old are you? - Do you like China?‘ they eagerly practiced with us. They smiled proudly when we told them they were doing great. Strolling through a park in Xi’an we sat down on the pavement and watched a woman singing with a whining high pitch voice, supported by a band of traditional Chinese instruments; the crowd was clearly amused when we took some pictures. Couple’s of all ages did ballroom dancing, people practiced Tai-chi and men played erhu (traditional Chinese two string violin) just for fun. In the Temple of Heaven a grey bearded man played a bamboo instrument and was proud we took a picture. Men and women enjoyed playing cards and Chinese Chess not only in parks, but even in the malls, airports and railway stations. Millions of people are migrating each year from the rural area’s into the big cities, bringing with them some odd behaviours which not necessary fit into modern city life. Francien and I walked in the concessions area of Shanghai passing a metal bin with live one-meter-long brown snakes. Much to our disgust we saw people sitting at the filled tables of the food stall eating them! Some toddlers wore pants slit from the crotch to the lower back, easy for going to the toilet simple by squatting! Oh, and what about that man defecating on a busy walkway in the middle of Xi’an? Francien cringed when she saw it! Another guy wore no shirt inside a restaurant in Beijing. One late afternoon Francien and I sat on a terrace of a western style café and watched how a woman took all her time to clean her ears with her car-keys. We could not help noticing people picking their noses and spitting on the street or into trashcans. In the crowds there was no respect for personal space, everybody pushing and jumping lines. When we got out of the underground train in Beijing, an old woman simply used both of her hands to push us away! Nevertheless, at all times people treated us correctly, mostly friendly and certainly willing to help us when we asked for directions or in eating places with choosing our food. As for finding a single English magazine in kiosks or book stores, forget it. The only newspaper I could read was the nationalistic Global Times, which reported that parents are waving out their kids going to the two day national exams (Gaokao, which is the university entry exam), a highlight in the career of any student. Indeed the next day Francien and I stood in front of a high school close to the Forbidden City in Beijing. Among tight police and military security, parents picked up their kids to welcome them home as this was their last day of exams. Extremely competitive (nine million students did do these exams this year!) and the Global Times reported that those students who cheated during these national exams will face jail sentences! No Nonsense! In China we came across a lot of symbolism and some very descriptive names: we did not sit in a bullet train, but rode the China Railway of Harmony. We were not on Tiananmen square, but walked on the ‘Gate of the Heavenly Peace’ square. Understanding this country and its diverse people is a fascinating and daunting task, but as a Chinese saying goes: All things are difficult before they are easy. For those of you readers who have not pressed the escape button yet, let me assure you: In this post I did not even scratch the surface describing this fascinating country! As for Francien and myself, we definitely want to go back.